Managing Kubernetes clusters on a large scale is a tough and complex job. It involves setting up multiple clusters, monitoring them, and updating them up with latest versions and security patches. And it gets even more complicated when you have a multi-cloud strategy and need Kubernetes clusters on different infrastructures. Imagine using vendor-flavoured Kubernetes versions on various infrastructure platforms and thus being trapped with old and/or platform-specific distributions. Or imagine having to adapt your apps and maintain different code lines for each of the infrastructure platforms (although the lingua franca of Kubernetes helps!). Aside from being tough, it would also create unnecessary overhead. What you really need in this case is a Kubernetes environment that provides uniform Kubernetes versions, has common monitoring and logging mechanisms, and allows you to securely manage various infrastructure and cluster credentials. That’s exactly how Gardener is making the lives of development and operations professionals much easier. Gardener is the open source orchestrator from SAP for managed Kubernetes clusters. 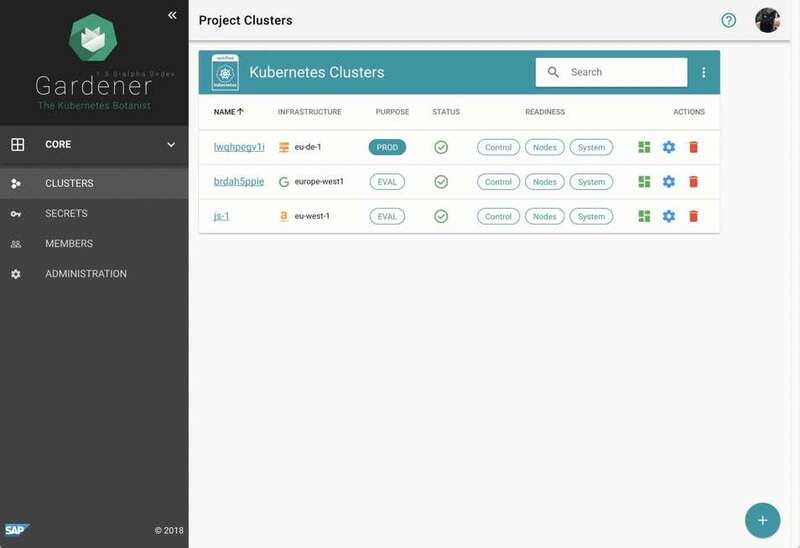 It offers Kubernetes clusters “as a service” by creating and managing Kubernetes clusters on various cloud infrastructure platforms such as Amazon Web Services, Microsoft Azure, Google Cloud Platform – and potentially in the future even on a customer’s own infrastructure. Gardener securely and homogeneously creates Kubernetes clusters with just a few clicks. Once your cluster has been created, Gardener manages, monitors, and – if anything goes wrong – repairs, patches, and even upgrades affected Kubernetes clusters in a fully automated way. Gardener keeps track of the vital components of these clusters, offering higher levels of service assurance. Gardener uses the official Kubernetes versions from the Kubernetes community, thereby providing the same Kubernetes on different infrastructure platforms. Want to learn more about Gardener and the technology behind it? Then go to https://gardener.cloud/ or have a look at this blog from my colleagues Vasu and Rafael. And did I already mention that Gardener is open source and hosted on GitHub? Feel free to have a look, comment or even contribute. I hope you have now a better understanding why containers are important for cloud native applications and how a container management solution like Kubernetes can help you manage your containers. There’s more to come – stay tuned.